There is always possible to improve stock market strategy that is used by traders or active investors. There is possible to make changes or modifications to any market strategy even it already generates money. These changes or additions to trader’s strategy are more frequent in early phases of learning how to trade stocks and make money. The frequency of changes is lower after good strategies are created already. But it does not mean that changes in stock strategy are not possible. A market behavior is changing during the time and so our strategies for trading stocks online has to be adapted too. But such changes should be done properly and with caution. If something works well then we do not want to kill it. So the basic rule for modification of market strategies for short term or mid term trading stocks online is to be cautious and test all changes by virtual trades first. Only when modified idea for swing trading stocks works then it is possible to use it on real broker account with real money. Although I hadn’t thought about this particular issue before, after reading it I spent some time on it. And I think it’s a correct statement. The best thing a trader can do is to add into an already profitable position if there are reasons for continuation of the trade. Or, if a trader already closed one position, then he can make a second (or third) entry into the trade during the current trend. As I mentioned, however, enter or continue only if there are reasons for the trend to move up in profit. The important condition for a possible new entry or addition into a profitable position is that the profit target zone defined by the next important level of support (for short trades) or resistance (for long trades) is wide enough. It doesn’t make sense to add to a position that already sit on strong support or resistance. 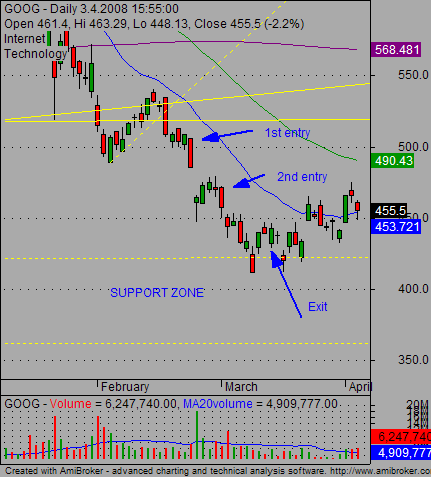 You can see such strategy example of possible re-entry on this GOOG stock chart. I did two trades during the downtrend, but probably adding into an already profitable short sell trade could be a better stock market strategy. 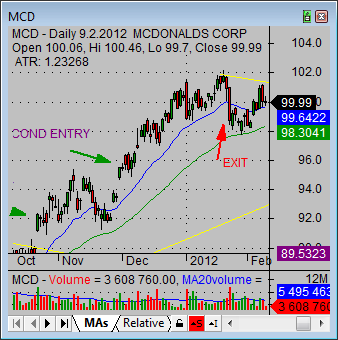 The second example is bullish stock strategy trade with MCD shares. First entry had been done after strong breakout from bullish chart pattern. Second addition to such position trade was possible after small pullback in trend move. 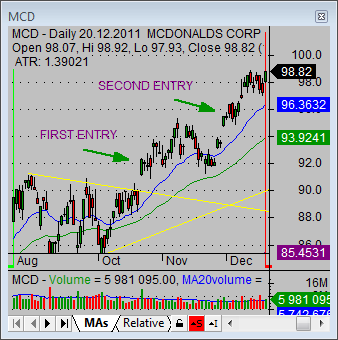 Both entries for this stock strategy are shown on the chart below. Short term swing trader will probably do two trades based on above entries. The adding into the trade was better choice for position trading stocks market strategies. The second chart shows possible exit point for this position trade stock market strategy. The exit was based on trailing stop loss level. Similar online trades could be done with many stock market symbols. They can be found in almost any type of market if you use good breakout or pullback market screeners.